We have purchased and sold cotton for over 22 years. We have watched cotton companies be sold and merged until there are now only several companies producing cotton rolls. For the most part, cotton produced by these companies is not much better than what you take out of your dryer lint trap. After a long hard search, we found a small company that produces a superior grade of cotton for us. Our latest grade of roll cotton is made from the finest, longest fiber cotton available. It is free of both debris and cotton waste. This is by far the best and longest fiber cotton we have found after inspecting samples from every cotton converter in the US and Canada. 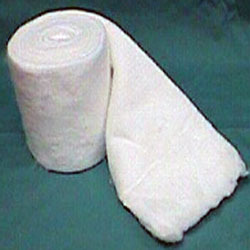 The absorbent cotton rolls we offer are a non-sterile grade. Each roll weighs 1 pound and has the approx. dimensions of 12 feet in length, 12 inches in width and is 3/8"-1/2" in thickness. The long fiber of this cotton makes it a great choice for making cotton tipped applicators. Because the cotton rolls we sell are far superior to any other brand on the market offered by any one else, it cost a few dollars more per roll but we know you will agree it's worth it. Our cotton rolls are sold by the each.